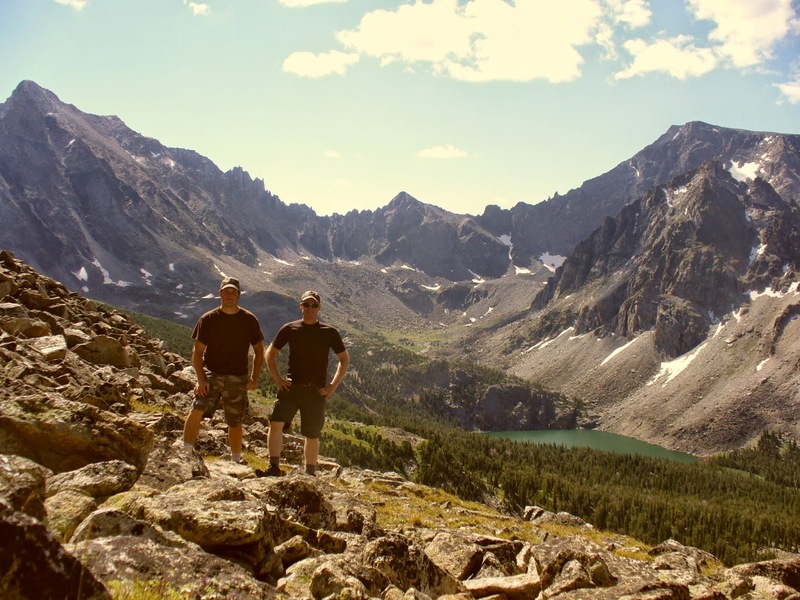 A friend of mine in Columbus, Montana has been after me to join him on a trip into the Beartooths to check out some lakes that are on his personal list of "yet-to-be-fished" water. 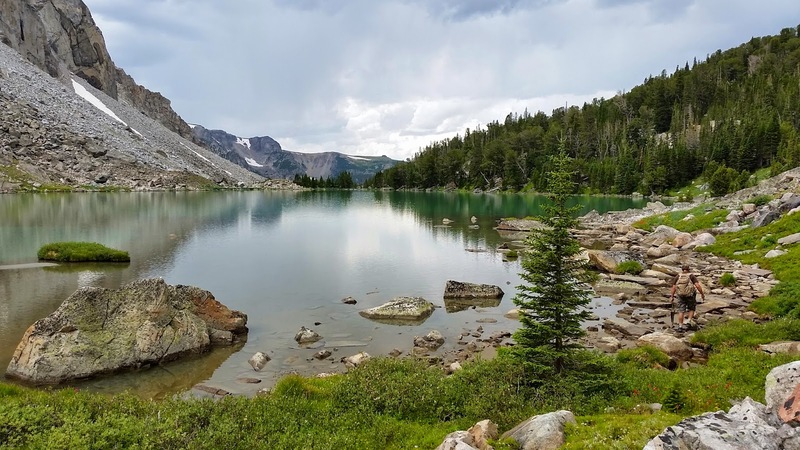 Previously I've only ever dabbled in relatively easy-to-reach Beartooth lakes, never having made a purposeful trip solely to fish in the backcountry. But my friend Travis makes a point of fishing new lakes up there each summer. And each summer he has to recruit new suckers join him on one of his grueling hikes. All of them are cross-country. Trails are almost never established. And if they are, he's less interested in going there. 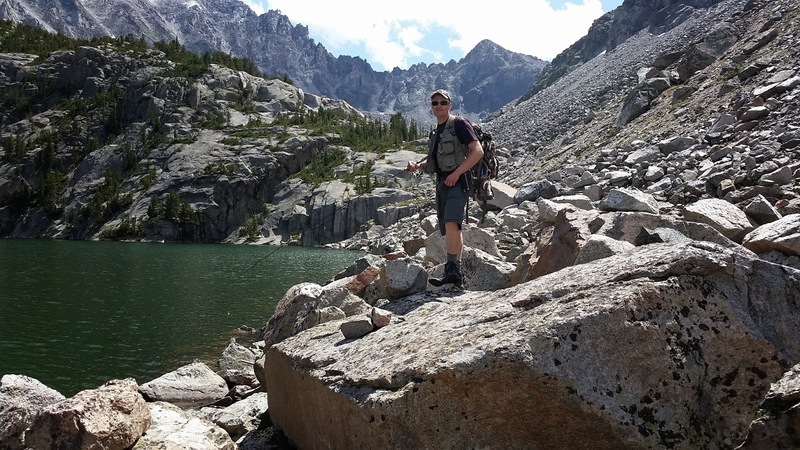 In summers past he's waited on hiking buddies to catch up, sometimes left them at one lake while hiking on to fish another, and even had folks stop and refuse to go on at the sight of a building thunderstorm. And of course, they never care to go again. Travis and I have covered ground together before, both in hunting seasons and on fishing trips. I've packed some of his deer and he's seen me haul mine out of the mountains in single trips. He had a hunch I'd be the sucker he was looking for this summer - a guy who's nuts about fishing, perfectly able to keep up, and would turn a blind eye to any thunderstorm if fishing were involved. The opportunity presented itself on an early August Saturday. It would only be a day trip. Over the phone in the week prior we looked at maps together. He had a lake in mind. One that had haunted him since the trip a few summers ago when his companion for the day came to a sudden halt at the edge of the plateau at the sight of a storm headed their way. There was the lake below them, the electric blue pool of water surrounded by plunging cliffs and boulder fields, only a mile and half away. One thousand vertical feet to decend. But behind them were six miles of trailess, boulder-strewn tundra and another thousand feet of vertical back down to tree line. I imagine not much was said on the hike back after Travis failed in his efforts to persuade his companion to continue. But here we were again, at least for him, standing on the same spot. The phone call and map planning had resulted in a chosen route different from his earlier attempt. At least to this point. We had gotten up that morning in the 3 o'clock hour and four-wheeled our way ever upward till we neared the wilderness boundary. 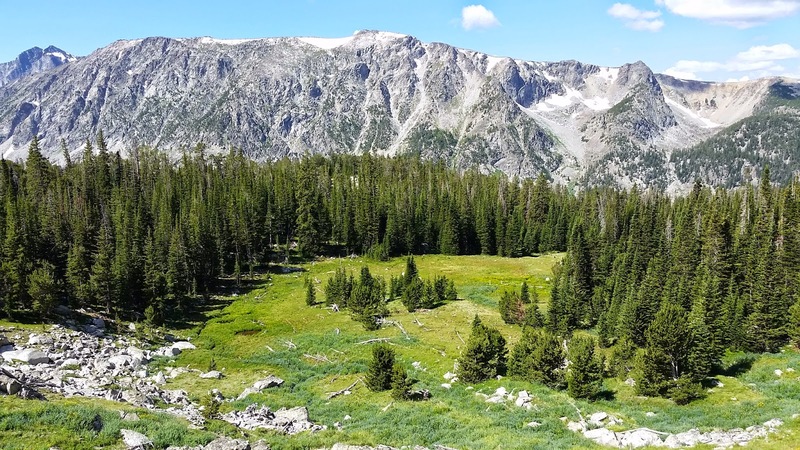 We'd strapped on our packs, loaded our .44s, and started picking our way up and out of the timber toward the 10,000-foot plateau. 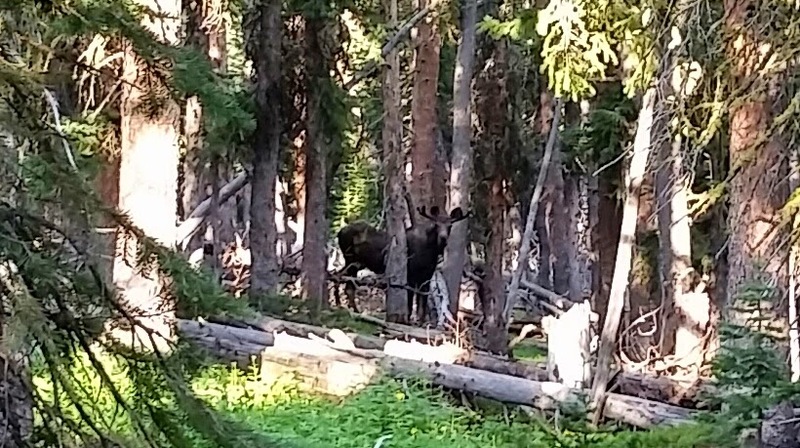 We'd bumped into a moose before leaving the timber. 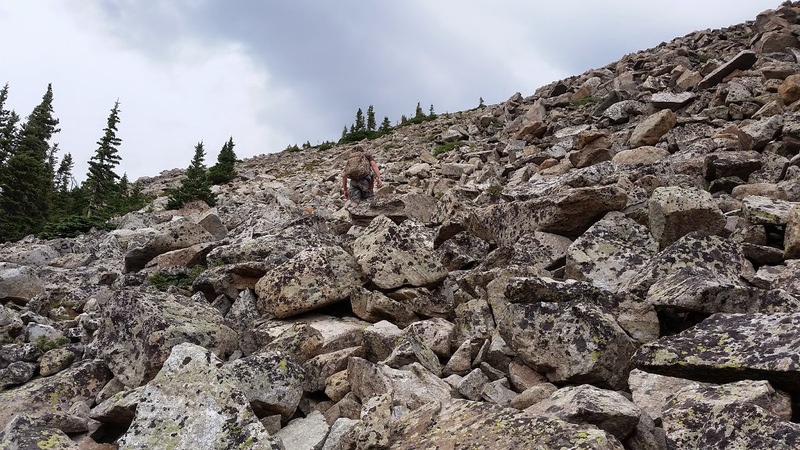 We'd slogged through spongy spots, scrambled over endless boulders, skirted remaining snow fields, and navigated around drainages that were cliffy canyons dropping 2,000 feet to streams below. Now, with six miles of hiking behind us, we looked down on our first of two lakes on the list for the day. The next mile was like walking down a giant stadium. Boulder after huge boulder stacked to the skyline above us and the valley below us at the angle of repose. It was a massive talus slope but with the contributing rock face since reduced to this mountainous pile of monumentally steep rubble. As we neared the toe, trees started to pick up. We traversed an avalanche chute and stopped to gawk at a couple alpine meadows and their hoard of wildflowers. There we were, two grown men, taking pictures of and googling at the wildflowers like a couple of high school girls picking out corsages for prom. Another half hour across a forested valley floor and we popped out on our goal. Lake number one. Off came the packs and the four-piece rods were strung up. 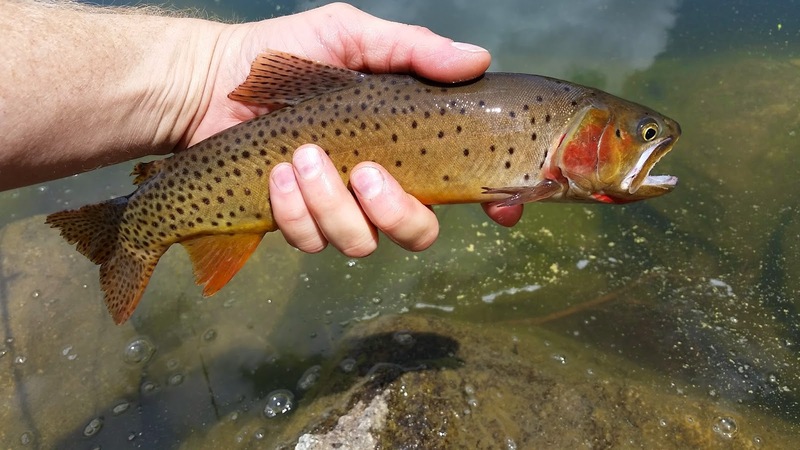 The first of between 90 and 100 cutthroats combined were being released just a few moments later. We forced ourselves to keep moving, skirting the lake and covering ground. Two hours later we were on the opposite side of the lake and not even beginning to tire of the magnificently colored trout being brought to hand and turned back. At the inlet we started to climb again, hiking up to a second lake higher in the valley. Between the two lakes flowing water could be heard beneath the boulders but rarely seen. In the one little pocket we came to of exposed water, Travis caught a cutthroat as big as any we'd seen so far. 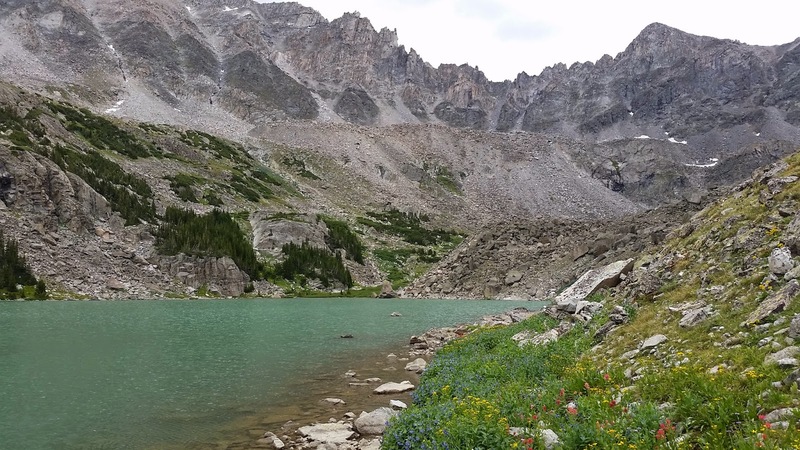 The second lake was stained glacial blue - fine sediments from the surrounding cirque hanging in suspension. Unlike the lower lake, fish were not immediately apparent, and it was a relatively long time till we landed the first one. But it was noticeably bigger than any we'd caught in the first lake. By the time we had circled the lake, we had several more, all heftier fish than those in the first lake. Some very close to the 18-inch mark. After waiting out a passing rain shower and an August pelting of sleet while tucked under a rock overhang, we started to add fish to the stringer for the hike out.With a few of these larger fish set aside to become fillets, we dropped back down to the lower lake to complete the limit. The lower lake could obviously benefit from from the removal of a few. Once the limit was full and the fish were cleaned and bagged, we disassembled our gear while ocassionaly cranking our necks skyward to glance at the looming mass of jumbled rock we were about to ascend. Much to our surprise when we began retracing our steps back to where we had hit the lake for the first time, we met two other men who were setting up camp. They were heartily impressed to hear we'd come in that same day and were only making a day trip of it. They only thinly veiled the fact that they thought we were crazy by calling us "ambitious." They had a night to sleep on it but were already dreading the return trip themselves. The climb out wasn't that bad. It was long, but we made it back to the vehicle in daylight. Having done so meant that we'd accomplished every goal for the day, along with a few bonuses like seeing the moose.